For v.2018 of CorelDraw. A handy macro that can make quick work of "chopping" shapes. Cut them in half vertically or horizontally. Cut them at a desired point either horizontally or vertically. Also cut them in 2 using the 2 point click method. This macro works on just about any type of shapes including many shapes at once, and even bitmap shapes. The macro preserves the selection so you can keep chopping over and over again. See the pictures and movies below! NEW For this version: -Angle chop in various ways -Custom live line mode. See the line that will chop the shape! -Deselect After -Lock mode. Chop it over and over again until you press escape. -Quick angle chop presets. -Modifier keys. 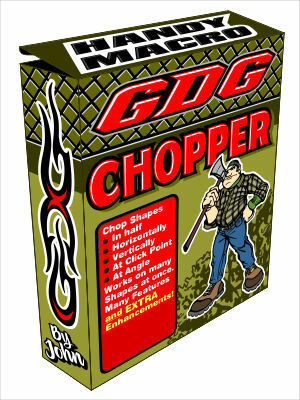 -Included instruction cdr file -Optimization for ultra FAST chopping! -Repeat function. -Many various fixes and more! Important! : This macro is only for CorelDraw v.2018. It will not function in any other version.